I find rockslides photographically entertaining and the lichen-covered granite rocks found on the south side base of Deboullie Mountain (Deboullie Public Reserved Land, North Maine Woods, T15, R9, Maine) make this rockslide especially so. The composition of this image was not very complicated. I zoomed out to 10mm and moved in close to a set of rocks with one having a particularly strong amount of lichen growing on it. I chose the camera elevation to keep the top point of that most-prominent rock within the water background, avoiding additional line intersections and adding to the horizontal layers effect in the upper portion of the frame. I then adjusted the camera distance to fully frame the closest rocks and avoid strong lines of contrast leaving the frame. Since the sky was clear and blue in color, I didn't need a lot in it in the frame for this particular image. I chose to keep enough sky to yield a clean top border and to add a full layer of blue color over and contrasting with the distant evergreens. This photo was captured handheld. I used the in-viewfinder electronic level to keep the image properly leveled and captured two frames. One frame was focused closer than the other and the two were manually focus stacked during post processing. Alternatively, a narrower aperture could have been used, but with the clean separation of foreground and background, I chose to use a sharper aperture (f/8 shows less diffraction softening than f/11 or f/16) and the focus stacking technique. This capture was timed with early evening, resulting in the best possible light quality just prior to the rocks went into full shade. While I frequently use a circular polarizer filter when photographing landscapes, I chose not to in this case. Because the sun was at a relatively low angle to my side and because I was using a wide angle focal length, the sky would have showed strong uneven darkening if this filter was used. 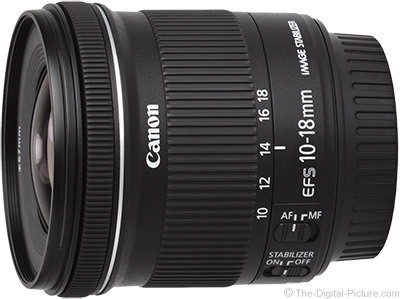 A Canon EOS Rebel camera and EF-S 10-18mm IS STM Lens make a great lightweight combination for hiking. The flowers were beautiful and the clouds were similarly so. In this scene, I moved in close to the flowers to create a sweeping curve opposite of the curve in the clouds. A field of fresh snow just awaits being painted. In this case, shadows of trees at sunset added the foreground interest I was looking for. One thing in life that I have a hard time resisting is photographing a great sunset. When the sky gets dramatic, little additional is needed in the frame for a nice image. When the sunset goes big, ultra-wide angles are needed to capture the show. This is a simple photo of an attractive church captured on a beautiful day with some interesting clouds in the sky. An ultra-wide angle focal length was needed to due to obstructions behind the camera position. The Canon EF-S 10-18mm IS Lens is a good choice when a foreground subject is to be emphasized (the coneflowers in this case), shown large in front of a minimized but broad background. A wide angle focal length can be used for portraits, including portraits of subjects with big noses, as long as the distance from the subject is not too close. In this image, a low camera position made the dog rise up above the distant mountain. When photographing landscape using a wide angle lens and having trouble keeping your own shadow out of the scene, consider embracing the situation. Take a selfie. Well, a shadow selfie. Any swimming pool can be made larger by simply moving to its edge and photographing it with an ultra-wide angle lens. This simple solution costs far less than hiring a contractor. Note that, even at 10mm, a circular polarizer can be used without an uneven sky being created if the sun is overhead.